I have made this dish a couple of times now and my husband and I love it! This is a fairly quick meal to put together as long as you've got everything ready to go before you start. While the recipe says to use orzo pasta, I used angel hair. 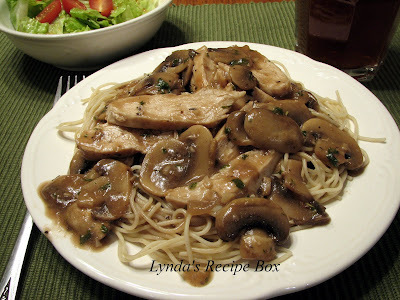 Topped with tender, juicy slices of chicken and mushrooms sauteed in butter, put together in a creamy balsamic sauce, this dish is delicious! The only problem I have with the recipe is that I would like a bit more balsamic vinegar in it, but my husband prefers it as written. I don't use some of the mushroom varieties called for in the original recipe, because they aren't always available. It's tasty, either way you make it! Preheat a large skillet over medium high heat and add olive oil. Dry chicken with paper towels; season well with salt and pepper and add to hot skillet. Cook for about 5 minutes per side, depending on size of chicken breasts. When done, remove chicken to a plate and cover with foil to keep warm. Turn the heat down under the skillet and add the butter. Add the mushrooms after butter melts and brown, stirring occasionally for 4 minutes. Add the onion, garlic and thyme and cook about 2 minutes until onion is softened. Sprinkle the flour into the pan and cook 2 minutes more. Whisk in the chicken stock, balsamic vinegar and cream. Simmer a couple of minutes or until slightly thickened. Slice the chicken on an angle and add to the skillet along with the chopped parsley. Adjust the seasonings at this time. Add salt and pepper if needed. 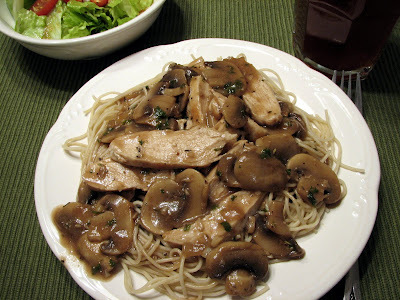 To serve, pile pasta on a plate and top with chicken mushroom mixture. And savor every bite! I love this dish with a simple salad and bread. Enjoy! NOTE: I have also served the chicken breasts whole, placing one on a plate topping the pasta, and then spooning mushroom sauce over all. Either way it's a winner. I love anything balsamic - cream, no cream, any vegetables, any meat - bookmarking this. It looks like heaven on a plate. oh, good call with the use of angel hair--that's my favorite pasta. now about this cream sauce--what decadence! Lynda, this looks gorgeous. I love the "cream" sauce and your photos are really wonderful. The balsamic cream sauce sounds amazing with this dish! This looks fabulous. I definitely think I'd be licking the plate after this. Bookmarked!!! has all the flavors we love. Cannot wait to try this. Thank you so much for sharing this delicious recipe!! Oh my, this sounds so good! We've got dinner plans for tonight already but tomorrow...Oh yeah, baby! This looks and sounds fantastic! I'm definitely going to try it! I much prefer the angel hair with this dish. We like orzo better in salads for some reason. Lots of mushrooms too....love it. And a basalmic vinegar cream sauce is new to me. Copying this yummy recipe now! This does look like a winner! I think I'll make it with extra balsamic then hubs won't know the difference! Lynda, this looks terrific. A great dish. I posted your Quick Rigatoni with Italian Sausage on my blog. I made it the other night and it was terrific...thank you! Oh yes, that is one big ole plate of love! We're having this for dinner sometime this week. It sounds amazing. The mushroom and sauce...oh,yes! How did I miss this one! My husband will love this! Oh how i like these quick and tasty recipes. I think it looks like it goes well with the angel hair pasta! I'll be making this one, thanks!